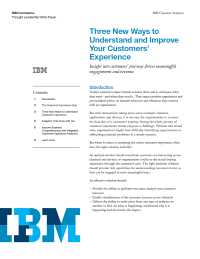 This thought leadership white paper looks at what an effective solution for analyzing the entire customer experience looks like, and three ways to better understand the customer experience. Today’s customers expect personalized, on-demand positive experiences whenever and wherever they interact with a brand. But with those interactions taking place across multiple channels, apps and devices, how does an organization take the broad view required to perfect the customer experience?